NEW SELECTION | Eight Special Grade Custom Crops with flowering jasmine and amaranth blossoms | Antioxidant-Rich – ‘Pearls of White Tea’ from the Tai Mu hills/Fujian Province in Southern China. The Silver Needles are tied together in the shape of a large button and hold jasmine and amaranth blossoms in the center. During the infusion the button will open and expose stringed-together blossoms that will slowly raise to the top of the beverage. 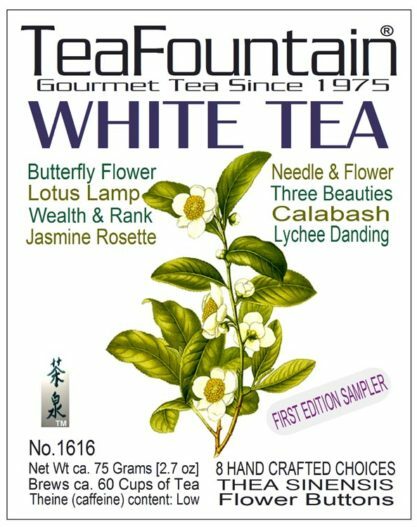 Also known as ‘display teas’, this ‘White Tea Sampler’ selection is prized for its special flavors. The infusion is clear and pale with a delicate scents. 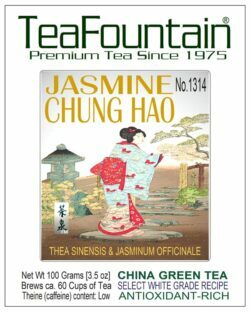 Serve as a healthy, cleansing and refreshing all-day tea or as an ‘Entertainment Tea’ at dinner parties. Makes several infusions per serving. 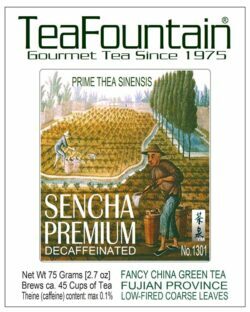 Tea content in box: ca. 75g (2.7oz) to 100g (3.5oz). 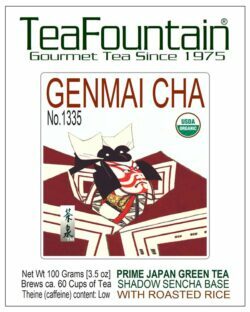 Culinary notes: Because of its fresh and light white tea character this Tea selection may be offered as a choice with light foods, vegetarian, macrobiotic or vegetable recipes and special desserts including fruits and lighter cheese selections. NEW SELECTION | Eight Special Grade Custom Tea Crops with flowering jasmine and amaranth blossoms | Antioxidant-Rich – ‘Pearls of White Tea’ from the Tai Mu hills/Fujian Province in Southern China. Ingredients: Whole Leaf White ‘Thea sinensis’ tea (silver needle tips & leaves) and hand-crafted flower blossoms from the Fujian Province in China. Preparation: Bring fresh water to the boil. Let it cool down for 2 minutes. 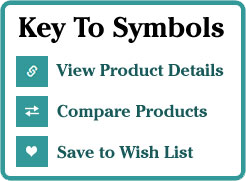 Warm up your tea-bowl or tea-pot by rinsing it with hot water. 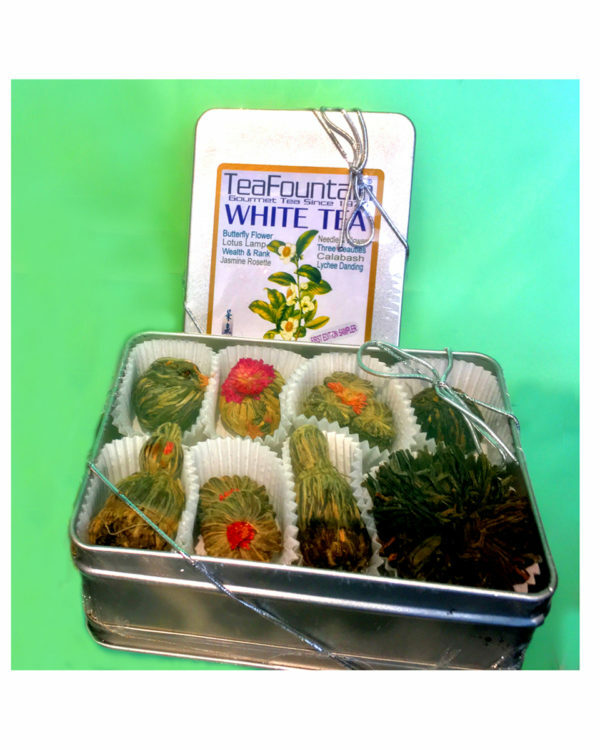 Place one Tea Ball per 8 oz cup of this ‘White Tea’ into the preheated cup or pot. Pour the hot water into the tea. Let infuse for 7 Minutes and serve. 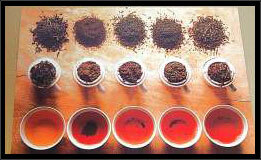 You may add more hot water to the tea to prepare several infusions until it becomes too mild. STORE COOL, DARK AND DRY!